BRUTUS, Mich. -- Hidden River Golf & Casting Club is named for the Maple River that runs through the property, which is located just northeast of Harbor Springs. 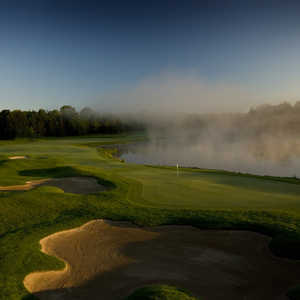 The river is mostly hidden by dense forest, while the golf course is shadowed by Michigan's nationally recognized Boyne Highlands Resort to the west and Treetops Resort to the south in Gaylord, among many others. Hidden River Golf and Casting Club's par-5 17th hole features a tough, elevated tee shot. It's tough being the little guy in a crowded neighborhood such as northern Michigan. I consider myself a northern Michigan expert, with about 40-plus courses visited on numerous trips, and I hadn't heard of Hidden River Golf and Casting Club (which opened in 1998) until very recently. Hidden River is a quiet, family owned and friendly golf and casting club that has 18 holes, plus a river and a fishing guide, who is available for hire to take groups out to fish for blue ribbon trout. Macy, the owner's dog, hangs by the bag drop most of the afternoon and greets golfers as they arrive. And Jerry Roman, the head professional and manager, runs the pro shop by himself for the entire spring season until he can get some summer help from college kids, including his brother, who goes to school in Florida. And while many nationally acclaimed architects have laid plans around these parts, Michigan's own Bruce Matthews III designed Hidden River. The golf course features a handful of different looks, beginning with three flat holes played through tall hardwoods near the clubhouse and entrance. After the par-3 third hole, a long cart ride takes you down along the river and up into a new section of the course. No holes actually play along the river, as environmental restrictions prevent it, and it sits so far below the ground at most points that it would be tough building anything around it anyway. Once you get to this part of the course, almost every hole is surrounded by trouble, whether it's forest or wetlands. Stray drives mean trouble, and the front nine is long enough that driver is necessary from the back two sets of tees on most holes. The par-5 seventh hole is virtually unreachable in two from the back tees, playing both narrow and 636 yards, making up a lot of the 3,694 yards on the front side. The back nine, on the other hand, plays significantly shorter, requiring more precision than power. Only one par 4 is longer than 400 yards from the back tees, and you can really score with good drives. Though flatter with more marsh and water than a lot of the more spectacular northern Michigan golf courses, Hidden River Golf and Casting Club has a few nice elevated tee shots that afford some added drama. The ninth hole is a short, downhill par 3 that plays closest to the river. The 15th hole -- one of the area's finest par 3s -- is a similar downhill shot, only the hole plays up to 243 yards. While most big-name courses like finishing with tough, brawny par 4s or long par 5, that's not the case at Hidden River Golf and Casting Club -- and that wasn't by accident. "The 18th is an intentionally milder par 4," Matthews said. "I wanted golfers to end their round feeling upbeat, getting their par and wanting to come back." 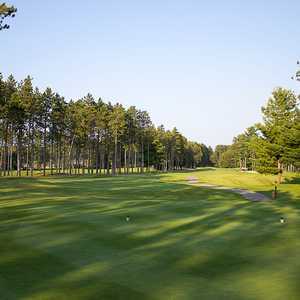 Hidden River Golf and Casting Club sits a peg below northern Michigan's nationally acclaimed golf courses. It is good enough, though, to warrant inclusion on your northern Michigan golf tour. Hidden River is part of the Big Fore golf package, which includes nearby Black Lake Golf Club, Dunmaglas Golf Club (two of my area favorites) and Little Traverse Bay Golf Club. 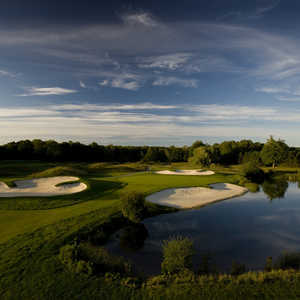 At 7,101 yards, Hidden River has plenty of bite from the championship tees, though there are four other sets, so you can pick your level of pain. The middle-back set of tees plays 6,638 yards and has a good mix of demanding and more gentle holes. Walking is allowed, but there are a few long drives between holes. While the golf course does fall a bit under the radar, the restaurant in the clubhouse does not. The Rainbow Room was rated a Top 4 Golf Course Restaurant in the Midwest, and a patio overlooks the Maple River. A casual-gourmet setting, the restaurant specializes in seafood dishes as well as Memphis-style Baby Back Ribs. Boyne Highlands Resort is a short drive away, and so is Treetops Resort to the south. For something a little smaller, check out Crooked River Lodge, just seven miles south of the golf course. It has spacious, lodge-style rooms. There is also a cabin at Hidden River that can accommodate groups of up to 12.